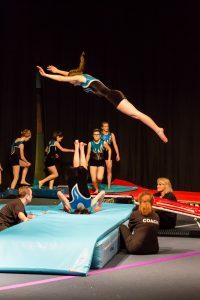 The Acro Display squad is designed to further build confidence in ability to perform more pair & group advanced elements (moves), including pyramids and aiming to participate in the clubs indoor and outdoor display events. Floor routines are set to music and choreographed to demonstrate a various number of level elements mixed with dance moves. Whilst Display squad members are not expected to reach and demonstrate a high technical ability, they will have to show a mixture of skills, strength, stamina and showmanship at the various club displays. These displays are often performed in front of large audiences and they require the gymnast to overcome the disadvantage of performing outdoors on uneven surfaces. The Senior display Squad is designed to provide the club and the gymnasts with the ability to demonstrate a higher level of skill that often results in some challenging and visually stunning routines. The Senior Display Squad also allows the more 'mature' beginner / ex-gymnast to take part in the sport of gymnastics without the pressure of reaching a technically high standard. A typical display routine also requires gymnasts to combine several elements into one single squad routine using trampette, vault, etc. 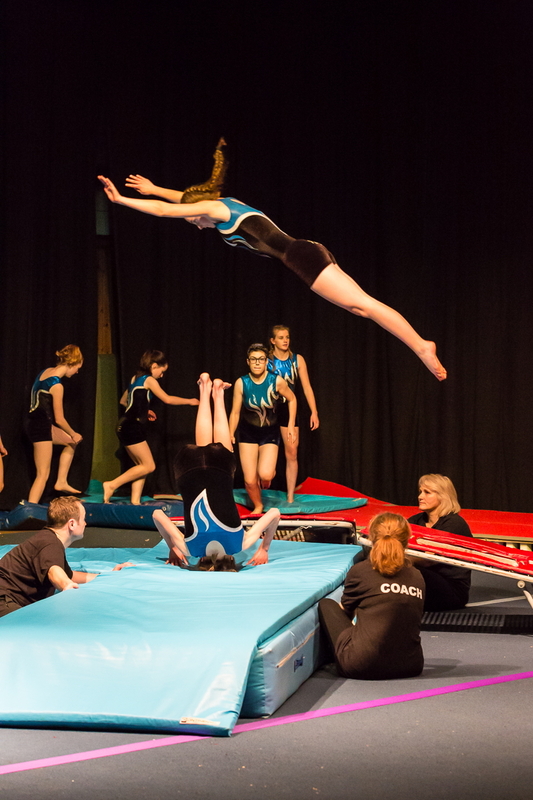 Dynamic elements include dives, jumps and various somersaults. The Display Squad is a TEAM group, they need to work very hard to maintain the self discipline, stamina and awareness of team members during routines.